The scenery of Battle Harbour in Southern Labrador, Canada shows its history as you enter the St. Lewis Inlet by the foot passenger ferry. As you cross the ocean by the foot passenger ferry and enter St. Lewis Inlet in Southern Labrador, Canada the scenery of Battle Harbour comes to light. The fog has not totally swamped Battle Island and the once lively community fishing village dots the coastal landscape. To reach Battle Harbour, a ferry runs back and forth twice daily from the middle of June until the middle of September providing the weather cooperates. The ferry leaves from the Visitor Information Center and Ferry Terminal in Mary's Harbour at the privately owned Battle Harbour's wharf. 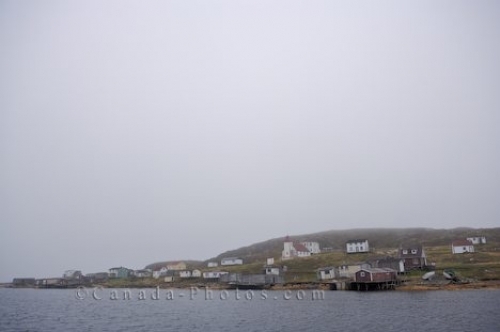 The historic fishing village of Battle Harbour situated on Battle Island at the entrance to the St Lewis Inlet seen from the ferry, Viking Trail, Trails to the Vikings, Southern Labrador, Labrador, Atlantic Canada, Canada. Picture of the scenery at Battle Harbour in Southern Labrador, Canada as the ferry nears the dock at Battle Island.